From Japan, we headed to Seoul, South Korea with Tak and Hiro for the second leg of our Asia Tour, to get an impression of the South Korean market. The whole time we were there we asked everyone we met the same basic questions, like: How much does a website for an SME cost here? and Do mechanics in South Korea usually have websites? Interestingly enough, everyone seemed to have different answer. One taxi driver was sure that the typical price for a website from a web designer was around $450. We spent a single (long) day in Seoul -- and gathered a few pearls of wisdom that we won't keep from you. Remember -- it was just a single day, so there's no guarantee that we got everything right. South Korea is the country with the highest rate of broadband penetration in the world (99% of the population1), and the number of smart phone Internet connections will top that soon enough. Five years ago, 96.8% of South Korean mobile phones were Internet-ready2. One in five of the 50 million South Koreans has a smart phone3. Thanks to KDDI Korea for the unbelievable statistical summary and the great dinner. South Koreans buy online a lot, and from what we learned there are a lot of small companies selling online. The supermarket chain Tesco has a great campaign showing what is possible in the realm of online sales: buying groceries while waiting for the subway. 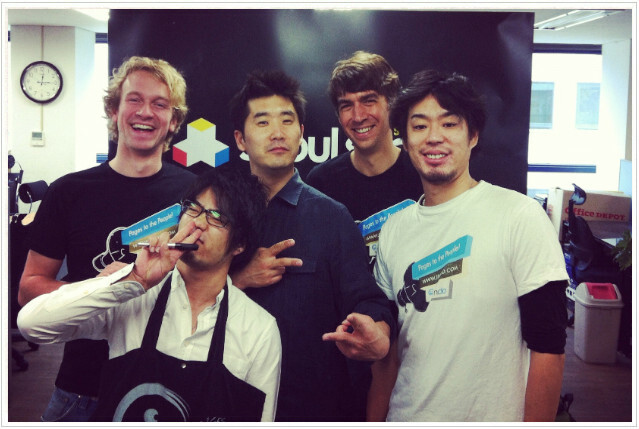 We asked around and found out about Seoulspace, an incubator for start-ups. What a great place -- communicative people, great conversations, and an invitation to a typical Korean lunch. They even made calls to set up our next appointments. Thanks to Richard, Jin and Richard. Congrats for the article in Inc.
Not only a search engine, Naver also offers a blog and café (seems to be a blend of Yelp and Myspace). What's interesting is that Naver gives preferential search treatment to content from the Naver platform (along with a lot of advertising). This ensures that a lot of companies use a Naver blog or Naver cafe page instead of a normal website. We couldn't really tell whether there are still a lot of companies with regular websites, because responses were so varied (depending on who we asked). Big or small companies and none im between. As soon as a company hits a certain size, it is usually bought out by a big international group. Has grown to 600 employees within one year. Extremely successful, most recently with their "Deals" product. Thanks to Kevin for the conversation and the delicious hot chocolate. Our final summary: A day full of nice folks and lots of positive impressions. We hope to come back soon!